Appearance (0-20): Let me start off by saying that I generally don’t purchase or smoke Permodo’s. Nothing against them, but I was never really “wowed” to go back to them. Walking around Cigars International, they had a new stick that jumped out to me right away. The wrapper is absolutely beautiful. I chose the maduro over the sun-grown for now, as I like the richer flavors of maduros. The wrapper is a deep, dark brown color that looks like on solid piece of tobacco leave. You literally can almost not even see a seam from when it was rolled. The band isn’t flashy, but catches your attention with the intricate gold, reds, and blacks. Construction (0-20): The cap clipped off easily, and yielded a nice easy draw. The burn was even all the way down and didn’t require any touch ups during the whole smoke. The ash held on about 1.5 to 2 inches, while sporting a bright white color ash. If you check out the picture, you can see the beautiful speckled white ash, along with the subtle box press shape. Well done. After some additional reading at CI, you will see that the wrapper extra fermented and placed in old bourbon barrels for 14+ months. Strength (0-20): The smoke was more full flavored, then full strength. Probably about medium to medium-full, it was well done and well balanced. Flavor (0-20): Initially there is some spice, but that rather quickly subsides. The most prominent flavors were rich chocolate and coffee. The flavors were strong and robust, and very consistent. There are some small bits of woodiness, leather, and additional spice that show their faces here and there. Personally, I would have like some additional spice due to the sweetness of the chocolate and coffee, but it was still well done. Value (0-20): $8.50 starts to move in some more premium sticks, yet still doesn’t break the bank. I think when you get close to $10, you need to offer something that is very well done. Overall, everything was consistent and there were no real stumbling points. As mentioned before, some additional spice would help with the balance, but still a strong value. Additional Notes: Smoked at Cigars International, paired with coffee. 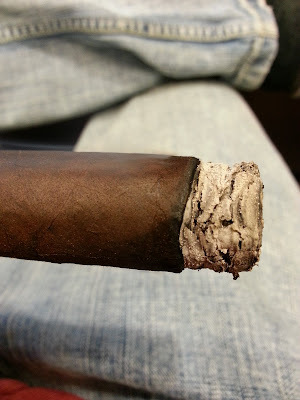 Overall (0-100): While Perdomo isn’t generally my cup of tea, I can honestly say that I was very impressed. This is a cigar that I would buy a box of and not think twice. I’d like to smoke the sun-grown wrapper for comparison, but the 20th Anniversary maduro was an excellent stick.